If you're a fan of #Jyunka or have been following Luxury Haven, you would've known that the Japanese cult brand has won numerous awards in the skin care industry. So I was pretty pleased to be recommended the Jyunka Whitening Facial Treatment At Immortelle Atelier. Jyunka's award-winning products include their Jyunka M+ Fluid ( Cozycot Holy Grail Beauty Awards, 2011 ), and their Jyunka Epidermal Peel Kit ( HerWorld Editor’s Choice Beauty Awards, 2013 )! The #Jyunka Whitening Facial Treatment At Immortelle Atelier consists of the Jyunka Boto Caviar Serum application, followed by the lymphatic drainage and acupressure massage for face and chest. The anti-wrinkle hexapeptide component in the serum possesses Botox-like features, for your muscles’ relaxation. Its counterpart, the Acacia Collagen, softens the skin and keeps it from chapping, allowing greater collagen production by the fibroblast. The Jyunka Stem Cell Mask and Cooling Eye Mask were applied next. During this time, the therapist provided a relaxing shoulder and hand massage. What I love about Jyunka's range of products is that your skin transforms and glows almost immediately. The application of the Jyunka M+ fluid ( Vitamin C serum ) after cleansing and toning, helps boost the production levels of skin cells, collagen, elastin and also strengthens the muscles with its anti-ageing properties. One single application gives you an immediate radiant glow and instant results! Jyunka Whitening Facial Treatment At Immortelle Atelier also includes the application of eye cream, moisturiser and sunblock. Priced at SGD 180 (120 mins), the Jyunka Whitening Facial Treatment is definitely worth a go if you're looking to achieve a glowing complexion. 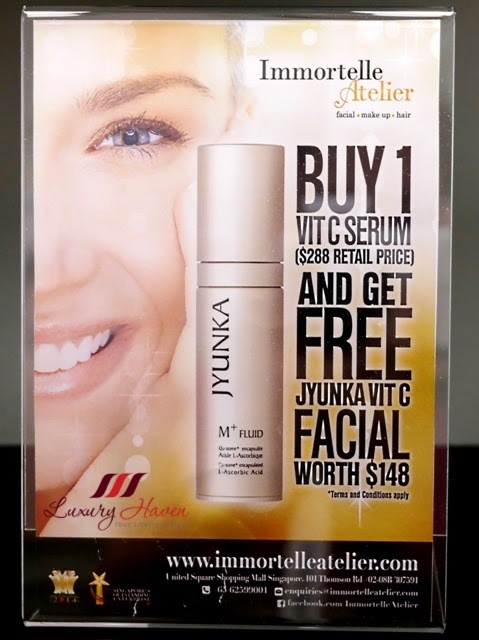 With each purchase of Jyunka M+ Vitamin C Serum @ SGD 288, you'll get a FREE Jyunka Vitamin C Facial Worth SGD 148!! *T&C applies. Call Immortelle Atelier at Tel: +65 6259 9001 for your trusted professional facial therapists now! Jyunka has launched another new product - the Jyunka Extreme Hydrant Serum @ SGD 148 (30 ml)! If your skin is lack of moisture and is desperately in need of more hydration, help is at hand! Jyunka Extreme Hydrant Serum immerses your skin in an aqueous environment and locking the moisture in the upper epidermis to ensure optimal cellular activity. A special Visco-Elastic Complex using high molecular weight proteins, provides a gentle nourishment, a protective layer, tightens facial pores and improves skin firmness. I love how the non-scented pinkish serum provides me with the moisture I'm lacking especially after my trip to Japan due to the dry climate there. I could feel my pores tightened, and my face feels soft and tender to touch. It's a very refreshing serum with visible results I would say. After thorough cleansing, apply suitable amount to the face and neck. Use the serum twice daily, in the morning and in the evening. Best used with a hydrating cream. Serum mostly work better in cold dry place. Ours too humid. Hi Rose, serum is light in texture. They absorbed well and works from deep within the skin layers. You need to add on a cream to seal in the serums, gives the skin protection and sense of comfort. Skin will then be perfectly prep for makeup. Jyunka, thanks for the reply! I'm sure other readers will find this informative! Wow doll you are very lucky this is impressive review and tutorial great for the skin I bet. Amy, always enjoy a good facial! Great post. Looks like you had a relaxing time. Lenya, it's was such a rejuvenating session! Elena, you're such a doll! Thanks, hun! Bisma, I'm sure you'll like it as much! it looks like a very great tratment i would like to try it! You must have enjoyed the facial very much! Mun, absolutely love the results! It's glowing! Haha! Kenny, thank you dear! Have a wonderful week! Nice post! Your blog seems to be interesting! Oh dear how lovely is that :). Looking so relax and needed. I used to do that once a week but no more time for me get such thing like this anymore. Tanya, once a week?? Wow, wish I've the luxury to do that! Home remedy is just as important. Love that too! Yay! I'm glad you're back from your wonderful trip (the Hello Kitty photo on your Instagram had me speechless!) :) This serum sounds very interesting and the mixture looks lovely and creamy on your face! Have a wonderful week! Gabrielle, hahaha! Those #hellokitty rooms have certainly attracted a lot of attention! You've a beautiful week too, my dear! I could use all of the above! Your skin looks amazing! You are so lucky to have all these facial treatments!! Great results!! your skin looks amazing! It looks like such a relaxing experience! Sera, looks like it really worked on my skin! Thanks for coming by! Your skin is almost flawless and glowing after the treatment. Nava, aw! Thanks for the sweet note! LookS like a good one dear. Adelina, you gotta try it to see the amazing results! Carmen, I'm sure you'll enjoy the treatment as much! Hi Shirley! Thank you for the very informative post. I'm not familiar with the brand but I regularly get facials - though I hate getting one to be honest. Your skin looks really flawless and radiant. I'm going to Singapore this month but I'm not sure that getting a Jyunka Facial will be included in my to-do list. Wow I would love to try out this treatment! It sounds so luxurious Shirley! Uru, thanks dear! Hope you've a great time in Aust too! Your skin radiates good health, Shirley - hope to follow your footsteps in skincare cos I really need to ..lol..brown spots popping all over! Sharon, it does! It's never too late, dear. Well, I started my 1st facial when I was 40. I'm really glad these facials are helping me to maintain a healthy skin. Pepper, I remember. Love the instant results they give! Thanks, sweetie! Your skin is so pretty and it even looks better after this treatment. Have a great day!